February Beauty Hits and Misses | Is This Mutton? I bought the Lip Shine because my lips were feeling very dry and uncomfortable under my normal lipstick from L'Oreal. Made in Italy, this lipstick has a lovely texture and what M&S describe as "a high shine gloss and a medium coverage lip colour that glides onto lips for a brilliant finish." Blood Roses is a non-threatening red, a little brick like, and it was very soft and moisturizing. If you ever have a Decléor facial, the therapist will waft their lovely tonifying lotion on tissues over your face in between stages. I'd forgotten how good it feels (and smells) to use this after a lotion cleanser. Sometimes at night you can't be bothered to lather up your face and a lotion or micellar lotion is what's needed. 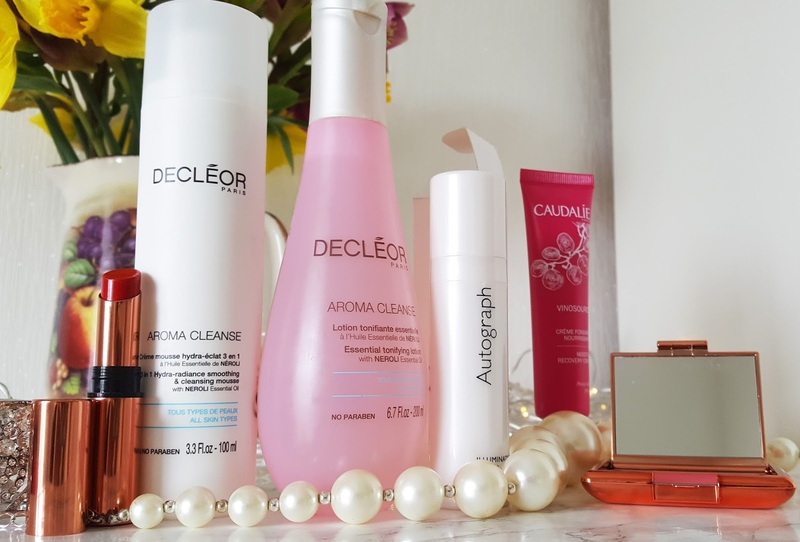 I never think it's enough so the Decléor Aroma Cleanse tonifying lotion finishes off the job (and still manages to removes a fairly horrifying amount of makeup!). M&S Autograph's Illuminating Primer. At £12.50 for 30ml, this is reasonably priced and does an equally good job as my normal primer from Laura Mercier. I like a primer specifically for smoothing the surface ready for make-up, with no intention of wearing it on its own. This one ticks the boxes. Foundation went on easily and lasted well. Job done. Caudalie Vinosource Moisture Recovery Cream: I'd heard great things about the Vinosource range so am currently using this as my daily moisturizer. It's only £23 whereas my normal moisturizer from Charlotte Tilbury is £70. Caudalie say the cream "restores the hydrolipidic film and strengthens skin barrier functions." To start with, I had sore misgivings: it smelt exactly like Clarins Beauty Flash Balm, which I've never liked, and disappeared pretty quickly which meant I definitely needed a primer before using foundation. But I have noticed the tiny lines in the lower part of my face are definitely more plumped up. So I'm pleased with it. Becca Resurfacing Primer. The wrong product for my skin. It's a matte lotion to help control unwanted shine and reduce the appearance of pores. It's probably better for younger women with oily skin. On my mature skin it was hopelessly drying and useless as a base for foundation. Liz Earle Superskin Treatment Oil for Body. If you look closely at the picture you can see the glass bottle has a chunk missing out of the top: it fell over on my glass shelf. But that's not the reason I didn't rate it. It has a pleasant smell but isn't very hydrating. I read that lotions are always superior in delivering moisturizers than oils, and my normal cheap and cheerful Dove Pro-Age cream oil is far better. I bought the Liz Earle product to use occasionally before a special night out but I wouldn't buy it again. Sally Hansen Miracle Nail Thickener. My nails are terrible and have been ever since I had acrylic nails (even though it was over 10 years ago). I've tried so many products. I always wear rubber and gardening gloves but my nails are constantly splitting and catching on things, no matter how often I use an emery board (in one direction only!). So I had high hopes for this product, which you apply like a clear nail varnish. The first time I used it, I could feel it had made the nails stronger and was optimistic. But it started peeling off, like cheap nail polish does. I've tried it a couple of times but it just won't stay on. Studio 10 Youth Lift Glow-Plexion: I've liked a couple of products in the Studio range, which is aimed at mature women. But I didn't see the point of this. Studio 10 describe it as a "Truly unique, multi-tasking primer, radiance creme, illuminator and highlighter in one bottle." To my mind, it's trying to do too much. It was inadequate as a primer for foundation. If it has any use, it's as a pearly highlighter: paint a line down the centre of your nose, dot a circle in the middle of your chin and apply a little to the top of your cheekbones. But even then, it isn't as densely illuminating as my beloved Stila product (now discontinued). Pureology Bodifying Luminator texturising shine foam for highlighted hair: a long-winded way of saying "styling mousse." I always use Pureology's products to try to retain my colour, but this was a big disappointment. The foam quickly turns liquid in your hand and it gave a sticky hold. I much prefer my usual Redken Pillow Proof blow dry lotion. Have you used any of these products? Any big disagreements? I'd love to hear. Great post! I really love the Decleor products. Well every girl wants to look pretty and for that, she uses every type of skin care products she knows. I am definitely going to try these. Thanks for sharing such an informative information.